As a parent, when all else fails, sometimes all you can do is laugh. But did you also know that finding the humor in a situation is actually a helpful coping skill that, when used correctly, can be very effective? For starters, laughter helps give you some objectivity and allows you to find common ground with your child, even during an interaction that might have been tense and angry moments before. Simply put, it’s hard to be mad and laugh at the same time. As you’ve probably noticed in your own life, the ability to find the humor in a situation can instantly dissolve a fight or help us relate to one another in a new way. Laughter should always be about the situation, and not about the person. If you laugh at your child, that can be shaming—and will probably cause his anger to escalate. Remember, how we look at things affects how we choose to react or respond to a situation. The ability to view the situation from a lighter perspective, when it’s appropriate, can help keep you calm and help you respond from a more thoughtful place, rather than from an emotional one. It’s important to note that one of the very first things we do in life is laugh, before we speak or even walk. There’s a reason people say, “Laughter is good for the soul,” and “Laughter is the best medicine”—there really is that physical benefit, because it relieves stress and benefits your circulation and respiratory system, to name just a few things. Humor helps to soften some of the worst blows that life delivers. 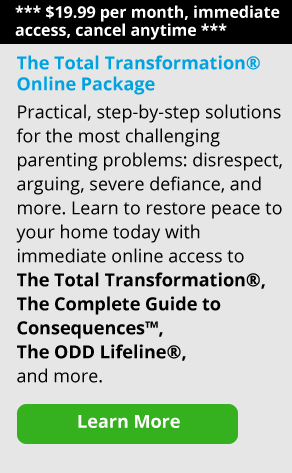 You may be sitting there saying, “You don’t know my kid—there’s nothing funny about his behavior.” We’ve worked with oppositional and defiant children and teens for years, and Kim is the mother of an adult child with ODD. Believe me, we know where you’re coming from! We’ll be addressing how to use a sense of humor with ODD kids later on in the article. As a parent, the question to ask yourself with humor is, are you joining with your child—is it shared humor? Or are you laughing at your child? Laughing at someone’s pain, hopes, fears or beliefs isn’t funny, but laughing together during a silly moment can do wonders to bridge a gap or defuse a fight. Above all, you don’t want to hurt your child’s feelings—that’s not the goal here. You don’t want to laugh at something that’s important to him or her. And of course, it’s never good to laugh when your kid has been hurt physically or emotionally. A question that can help your child. A great question to ask when things are getting tense is, “Wow, why are we arguing about something so small?” This pulls both of you out of the argument, lightens the mood, and gives you some objectivity and perspective. Let’s say you want to see one movie but your child would rather go to another, and you start to argue. You can calm things down by saying, “Okay, this is silly, huh? You pick the movie this time, and I’ll pick the next one.” That way, you are modeling to your child how to change the mood and put things into perspective. Focus on your child’s strengths. One parent we knew had a son who would argue and argue, no matter what was at stake. He always had to have the last word, and his mom said it was exhausting. One day when he was explaining yet again why he shouldn’t have to do his chores, she thought to herself, “Man, someday he’s going to make a really good lawyer. I can just see him up there arguing in front of a judge. And the judge is going to say, ‘Oh my Lord, enough already!’” The mom didn’t share this with her son in that moment—he would have gotten defensive and angry—but it helped her put his behavior into perspective and have a moment of private amusement. For Parents of Defiant or Oppositional Kids: For parents of really defiant, oppositional kids, it may feel like there’s nothing to laugh at. Life can get so difficult with these kids – it can become very intense and exhausting. But even with ODD kids, there’s actually a lot that you can find to laugh about. Again, you don’t want to start laughing at your child—you probably already know that if you laugh at an ODD kid, he’ll usually escalate. You can laugh to yourself, though, when the situation gets ridiculous. Here’s a good example. One parent we worked with had a 16-year-old boy with ODD. She had to call the police because he’d become violent and broken some things in the house. While talking to the officers on the front porch, the boy actually said, “I want to get emancipated and live on my own, but my mom won’t give me a ride down to the courthouse so I can fill out the paperwork.” (He didn’t have a driver’s license and hadn’t yet taken driver’s ed.) The mom walked away and chuckled to herself privately. We also want to state here that just because you find some humor in the situation doesn’t mean you’re minimizing it. It doesn’t mean you’re saying “This is funny so there aren’t going to be any consequences.” You’re still following through as a parent, but you’re also keeping your head above water by allowing humor to give you some perspective.